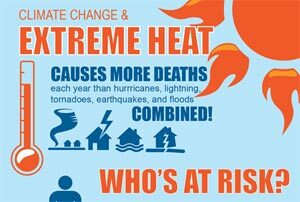 Extreme heat typically occurs in the summer months, producing high temperatures that can be deadly. Install window air conditioners snugly and securely; insulate around the unit if necessary. Weather-strip doors and sills to keep cool air in and hot air out. Know those in your neighborhood who are elderly, young, sick, or overweight. They are more likely to become victims of excessive heat and may need help. People living in urban areas may be at greater risk from the effects of a prolonged heat wave than are people living in rural areas. Continue to listen to NOAA Weather Radio, or local media outlets, for more updates from the National Weather Service (NWS). Consider spending the warmest part of the day in public buildings such as libraries, schools, movie theaters, shopping malls, and other community facilities that have air conditioning. KEEP HYDRATED! Even if you do not feel thirsty, drink plenty of water. Avoid caffeinated drinks. Persons who have epilepsy or heart, kidney, or liver disease; are on fluid-restricted diets; or have a problem with fluid retention should consult a doctor before increasing liquid intake. Seek shelter in an air conditioned facility such as libraries, shopping malls, movie theaters, etc. Find more information on this topic and many others from the Atlantic County Division of Public Health. Public Health information on flooding.